A contact center (also referred to as customer interaction center) is the central point of customer management. While traditional call centers focus solely on voice calls, omni-channel contact centers manage various modes of communications like voice calls as well as data applications like emails, web-based chats, instant messaging and webpage sharing. Regardless of the type of business, customer service and the customer experience is a crucial component of success. Great customer service provides a distinct edge over your competitors, however, if you are planning to outsource customer care, it is imperative that you do enough upfront research to ensure you make the best possible decision. Before you outsource, you must be clear about your own business requirements. It is important that you clearly define the type of support you are seeking along with any specific performance metrics that your BPO partner will be expected to accommodate. Outsourcing is an investment and you should take steps to protect it. Investigate potential contact center partners by getting in touch with their existing clients. Ask for their candid reviews of the contact center, its management team and overall performance. The insight you gain from their feedback will be valuable in evaluating the contact center. Other areas to explore include the contact center’s prior experience working with businesses that have requirements similar to yours, their standard service level agreements (SLAs) and approach to ensuring high levels of customer satisfaction. When you outsource something as important as customer care, you need assurance that the provider you select is as invested in the relationship as you are. In general, you should define your expectations and hold the contact center accountable for meeting all established performance metrics. Ask about their agent training initiatives and disaster recovery/business continuity plans. Also, take some time to observe their contact center environment in action. This will provide you with a clearer picture of whether they can represent your company appropriately. Along with reliability comes the question of security. Your contact center partner must provide strict security protocols to maintain customer and data confidentiality and avoid data theft, data corruption, and data fraud. There needs to be clear understanding regarding the mode of communication between you and your contact center partner. A solid plan and efficient date recovery system should also be in place so that unforeseen emergencies do not result in business interruptions. Be sure to thoroughly vet how a potential contact center partner’s data would integrate with your company’s existing CRM (Customer Relationship Management) application. If they have the specific software to do so, it will save you time, money and result in quicker business growth. Social media has grown increasingly important in recent years and your business partner must be capable of integrating with your social media platforms. 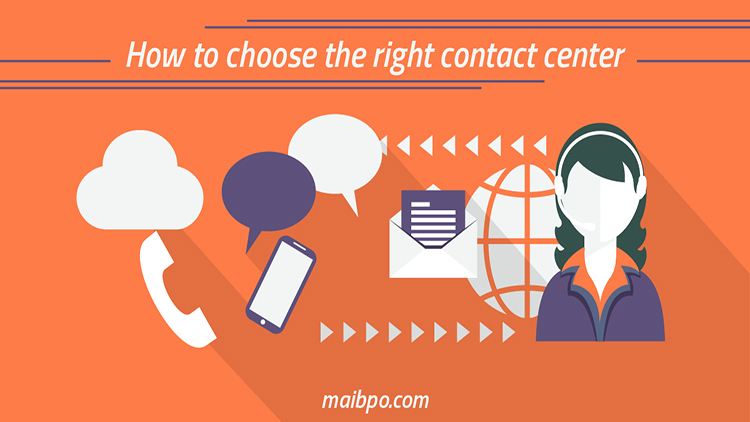 Location is often an important criterion while choosing contact centers. Your business might require a center closer to your company or it may require being in different parts of the world. Thus, the location of the contact center should be strategically placed in the interest of your requirement while benefiting the customers. When you decide to invest in outsourcing, understand all the costs involved. There should not be any surprises once the contract has been signed. The key to a successful partnership is based on complete trust and transparency. Choosing the right contact center partner can benefit your company in several different ways, but only if you choose the RIGHT partner based on your specific requirements. So make sure you undergo a thorough check before you choose the right contact centers that would meet the requirements pertaining specifically to your business.